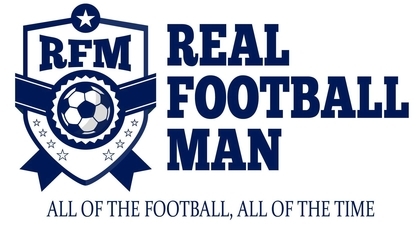 Don’t be sad that the domestic football season is coming to an end, be joyful that another World Cup is just around the corner. With the tournament now just over a month or so away it is time for a myriad of wall charts and previews to be digested and this website is no different. As per usual 32 teams will bid to be World Cup winners – although this could well be the last time in which we see numerical symmetry as Qatar are ready to host a tournament with 48 entrants. Whether that is the case or not we will have to wait and see but regardless of the number of teams taking part those fortunate enough will be in their last few weeks of preparations. Before the tournament kicks its first ball on June 14th, each of the 32 nations who have either been fortunate to host the game’s biggest party or qualify for the finals will have a handful of friendlies to take part in, these will not only act as the ideal opportunity for players to get up to full speed before the cut and thrust international football restarts. But it will also offer the 32 men who are going to be in charge of each of the respective nations the chance to cast an eye over the players who will have been named in the provisional squads. This usually means that 30 or so players will make the first step towards World Cup selection. From there, it is a case of desperate heartbreak for the seven men who will be left behind while the other 23 embark on the plane ride to Russia (of course the host nation will not be getting a plane, perhaps more likely a coach), this means that 736 players will be fortunate enough to be part of a competing World Cup squad. And with any major international tournament it means that there will no doubt be an influx of betting before and during proceedings. If you are an avid punter then there will be countless numbers of bookmakers looking to get hold of your hard earned cash, while there will be hundreds of markets on which to bet on. 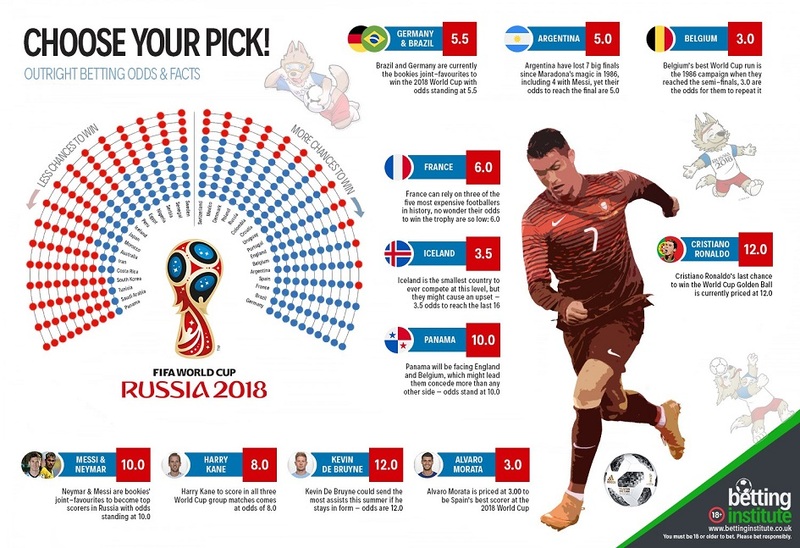 The litany of potential betting offers may ask the question just where do you start, a good place would be the World Cup 2018 betting guide by Betting Institute, thankfully their very informative article on what is an incredibly useful website will clarify any questions you may have when it comes to making some pre-tournament punts. The smart money seems to be on Brazil and Germany, they obviously can’t both win the trophy but if you were to pluck for one of these nations then you can currently get odds of 5.5 for either Brazil to win a first trophy since 2002 or for Germany to defend the title they won four years ago. Should you want to look past these two, then France could provide a route to victory. The European Championship runners up just two years ago, they will look to be the bride rather than the bridesmaid this time around and repeat their 1998 success which came on home soil. They are currently at decimal odds of 6. At the same time though there are 29 other nations you can pin your hopes on and the neat guide above will give you a steer as to who to back and who to avoid. Not only that though there are a number of different betting options if you don’t fancy an outright punt. One of those will be the Golden Boot, if a nation cannot win the tournament then the blow can at least be softened slightly by finishing the tournament as top scorer. At present the bulk of the money in this market is being placed on the South American duo of Neymar and Messi. Once teammates at Barcelona, that duo has long since broken after Neymar’s big money move to PSG last Summer, whether he is still there next season remains to be seen, but what is a certainity is the decimal odds of 10.0 that both he and Messi are currently at to be the tournament’s top scorers. 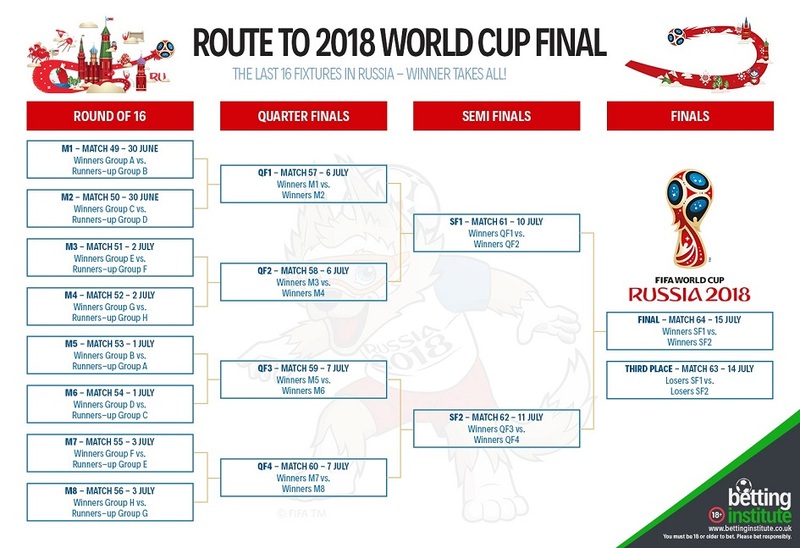 Here you can map out who you think will be playing who once the group stages have been passed, by plotting your own route to the final you will be able to see just who edges closer to the final in Moscow on July 15th, will it be your nation. If not then you best keep your fingers crossed that it is the one that you bet on. Wherever you decide to spend your money, be sure to enjoy what is set to be an absolute feast of football. I don’t know about you but I cannot wait!